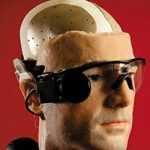 The first-ever bionic man, a 6.5-foot cyborg, is the subject of a Smithsonian Channel documentary October 20 at 9 pm Eastern time. The man has a million dollars worth of state-of-the-art limbs and organs. “THE INCREDIBLE BIONIC MAN” follows psychologist Bertolt Meyer, who has a bionic hand himself, as he meets scientists working at the cutting edge of research to find out just how far this new technology can go. The cyborg was built by roboticists Richard Walker and Matthew Godden from Shadow Robot. They used artificial body parts designed by scientists from around the world, including a spleen-on-a-chip from Yale University and a kidney from the University of California, San Francisco. The documentary coincides with an actual visit from the bionic man, first in New York and then in Washington, D.C. Read more here.